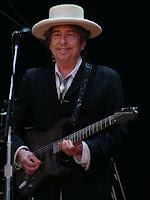 Tom Kepler Writing: Bob Dylan Dot Com and What About Artists "Knockin' at Death's Door"? Bob Dylan Dot Com and What About Artists "Knockin' at Death's Door"? Bob Dylan is 71 years old, and he has just released his new album Tempest. According to my hand count of covers from his website, bobdylan.com, that makes fifty-nine albums in his fifty-year-plus career. I'm not going to focus on Dylan's career, though, or his new album; there are plenty of writers and music critics out there much more qualified than I who can and are doing that. Costello's use of shady is, of course, apt as a literary descriptor, since Homer and the ancient Greeks referred to the dead in the underworld as the shades. Bob Dylan is seventy-one years old. I am sixty years old. Dylan's work has been a lifetime of prolific creation. I've spent a great deal of my life pouring my creativity into teaching in the classroom and another large dollop in my late 40's and early 50's as the primary caregiver for my first wife, who passed away in 2003. In addition to those good tasks, I've also managed to publish four books plus a scattering of poetry in literary little magazines so far. I'm not particularly interested in considering myself at the end of my creative time just because I'm now a greybeard. I'm sure Dylan isn't interested in having the debate of "What in the heck are you thinking, putting an album out at your age?" Nonetheless, one cannot deny the accumulation of years. Perhaps I should just think, "Don't look back, it's all right" . 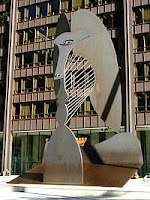 . .
Pablo Picasso died at the age of ninety-one and was prolific in his later years. According to Wikipedia, in his later years Picasso "became more daring, his works more colorful and expressive, and from 1968 through 1971 he produced a torrent of paintings and hundreds of copperplate etchings. At the time these works were dismissed by most as pornographic fantasies of an impotent old man or the slapdash works of an artist who was past his prime. Only later, after Picasso’s death, when the rest of the art world had moved on from abstract expressionism, did the critical community come to see that Picasso had already discovered neo-expressionism and was, as so often before, ahead of his time." My father is ninety-one years old and is in his feeble years. What lies ahead for me? I practice Transcendental Meditation and lead a healthy lifestyle, yet I've also seen a number of people who practice TM pass on at my age or younger from heart weaknesses or other hidden biological timebombs that lay nestled in their physiologies. Evidently, death recognizes no silver bullet. The answer, of course, lies not in the body which must needs feel the pull of the tides of time; the answer lies in the transcendental nature of our Self. We must realize and live that. As Voltaire said, "That is all very well and good, but let us tend our gardens." Yes, I will continue my routine and recognize my accumulating years--but continue my work. "Mystery is ancient. It's the essence of everything. It violates all conventions of beauty and understanding. It was there before the beginning, and it will be there beyond the end. We were created in it. The Mississippi Sheiks recorded a song called "Stop and Listen." To most music aficionados, it's but a ragtime blues. But to me, it's words of wisdom. Saint Paul said we see through the glass darkly. There's plenty of mystery in nature and contemporary life. For some people, it's too harsh to deal with. But I don't see it that way." I remember Maharishi Mahesh Yogi saying that time is our most precious commodity. We can always make more money, but we cannot make more time. We should use our time to discover within ourselves the full range of our Selves and existence. A routine of meditation and engaging in productive work is a powerful recipe for personal growth--and for adding something to the world. For me right now, I teach and I write. It's good work. Don't let me catch you staring at me and glancing at your wristwatch. I don't have time for that, and neither do you. I'm interested in what happens on the next page, not what happened on the last.